Whether you're celebrating a honeymoon, a Valentine's Day trip, or just enjoying a romantic getaway with your loved one, there's no doubt that you'll want to treat yourself with a dinner date upscale restaurant during your stay! To help you enjoy a truly memorable date night, we picked out the 6 best romantic restaurants in Gatlinburg for couples! These fine dining establishments offer the perfect ambiance for an excellent night out with your sweetheart. The Peddler Steakhouse in Gatlinburg is a classic option for couples enjoying a romantic getaway in Gatlinburg. Located a short walk from the main parkway in Gatlinburg, this Downtown restaurant has a great riverside location. Inside, you'll enjoy a relaxed ambiance with rustic décor. In fact, the inner part of the restaurant is actually a historic cabin constructed from whole timbers and cement chinking. These cabin walls are even visible on the building's interior. You can even enjoy views of the river from the Peddler's back dining room. The Peddler is a classic steakhouse that specializes in hearty American fare, so it's ideal for a night of fine-dining with your loved one in the Great Smoky Mountains. 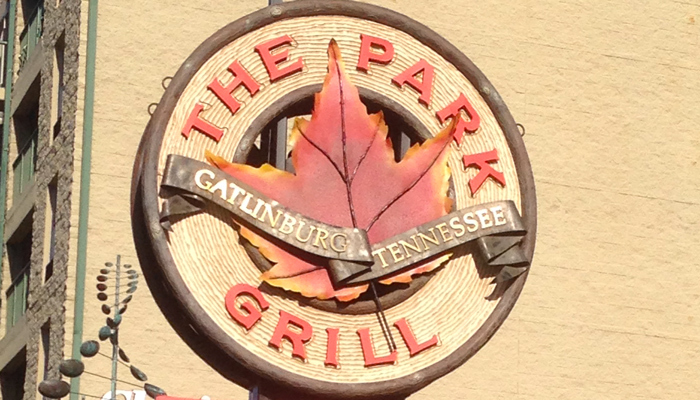 Located right on the main drag in Downtown Gatlinburg, you'll find The Park Grill, another excellent steakhouse option for couples in Gatlinburg. This upscale restaurant features low-lighting, tasteful décor that's inspired by the natural beauty of the Great Smoky Mountains National Park. As a result, this mountain lodge-style restaurant is perfect for enjoying a delicious steak dinner or a trout feast! With the Park Grill's great location downtown, if you'd like to go for a relaxing stroll with your sweetheart after dinner. The Greenbrier Restaurant is a unique restaurant in Gatlinburg with plenty of history. The original building of the Greenbrier Restaurant is in a historic log hunting lodge built in 1939. In the early years, this building served as an inn for vacationers visiting the area. For decades, this building has welcomed hunters and travelers, and today The Greenbrier Restaurant continues this tradition of hospitality. The Greenbrier is a local favorite that serves delicious steaks, seafood, and trout. While this restaurant features a more of a "no frills" dining experience, it does boasts a beautiful forested location and the entire building is filled to the brim with local charm. The main dining area even has floor-to-ceiling windows to showcase a beautiful forest view. The Greenbrier Restaurant is located a short drive from Gatlinburg's East Parkway. This restaurant isn't within walking distance of Downtown, so it's a great place to go if you need to get away from the crowds. If you're looking for a unique dining experience in Gatlinburg, the Greenbrier is the perfect place to go for a romantic evening with your sweetheart. 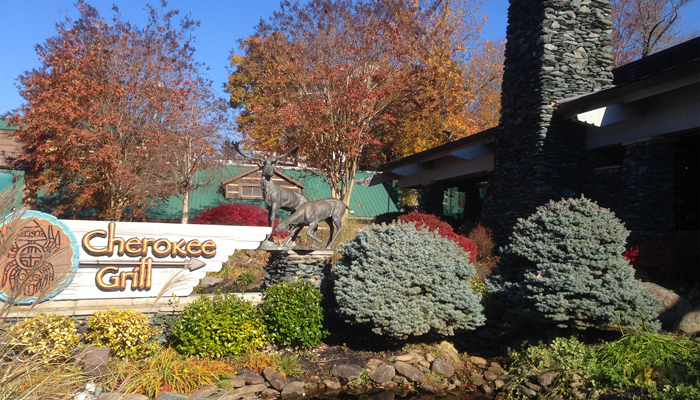 The Cherokee Grill is another mainstay of the Gatlinburg dining scene known for providing delicious food and a great dining atmosphere. The entire restaurant is filled with an earthy color palette and plenty of stacked stone. Additionally, this restaurant is great for couples since it offers low-lighting and plenty of alcoves that are perfect for a private dinner with your sweetheart. This downtown Gatlinburg restaurant specializes in steaks and seafood. The Melting Pot in Gatlinburg offers a nice romantic dining spot that's located right on the Gatlinburg strip. This restaurant's modern casual vibe makes it ideal for a date night and its upstairs location offers some nice views of the Gatlinburg strip. The Melting Pot specializes in a variety of cheese fondues, steaks, and seafood classics. For truly special occasions, the Melting Pot even has 4-course meals and decadent add-ons such as a whole cold water lobster tail. You can even finish off dinner with a dark chocolate fondue or a delicious Bananas Foster fondue. 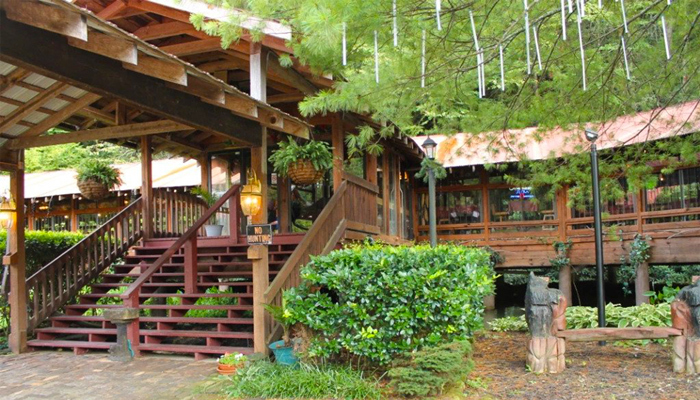 Built on the site of an old trout farm, the Crystelle Creek is a Gatlinburg Restaurant with a beautiful creekside location. In fact, this restaurant sits on property that is adjacent to the Great Smoky Mountains National Park. This nice restaurant is located a short drive from Downtown Gatlinburg on the East Parkway, so it's a nice quiet spot to get away from it all. With a heated, enclosed dining porch with a view of the creek, you can even enjoy hearing the sounds of the cascades during your meal. Famously, this restaurant boasts a beautiful 150-ft tall tree decorated with lights, so you can enjoy dining near a lovely light display. Crystelle Creek specializes in trout catfish, steak, and pasta dishes, so you can find just what you're looking for on your date night. 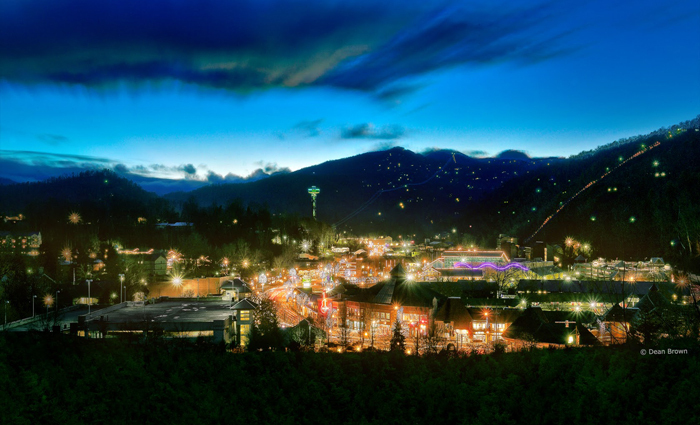 Better yet, this Gatlinburg even offers live music nightly. Whether you're celebrating Valentine's Day in Gatlinburg or you just want to enjoy a special date night, these romantic restaurants are the perfect way to finish a great day in the Smokies. To make your couples getaway even more memorable, be sure to check our guide on the most romantic places in the Smokies or the best couples activities in Gatlinburg. What is the best mini-golf in Gatlinburg? It can be difficult to decide with each course offering its own unique pros and cons. Luckily, Cabins USA is here to give you the details on all the options for mini-golf in Gatlinburg to help you choose. Whether you're looking for steaks or one of a kind dishes off the beaten path, there are plenty of romantic dinners in Gatlinburg, TN to take your sweetheart out for a romantic meal on your Smoky Mountain vacation. Here's our guide. There's nothing better breakfast than a huge stack of pancakes when you're on vacation in Smokies. From buttermilk to blintzes, here's our guide to the best places to get pancakes in Gatlinburg!